My husband has developed a taste for spice that few peppers can temper. We had a whole garden bed devoted to the fiery little bits. 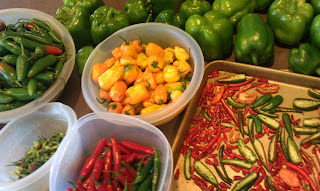 This is a small portion of our harvest, in the back you can see the bell peppers…second class citizens. We’ve dried and pickled serenos, jalapenos, Thai chilies, Tabasco “super chilies” and habeneros . 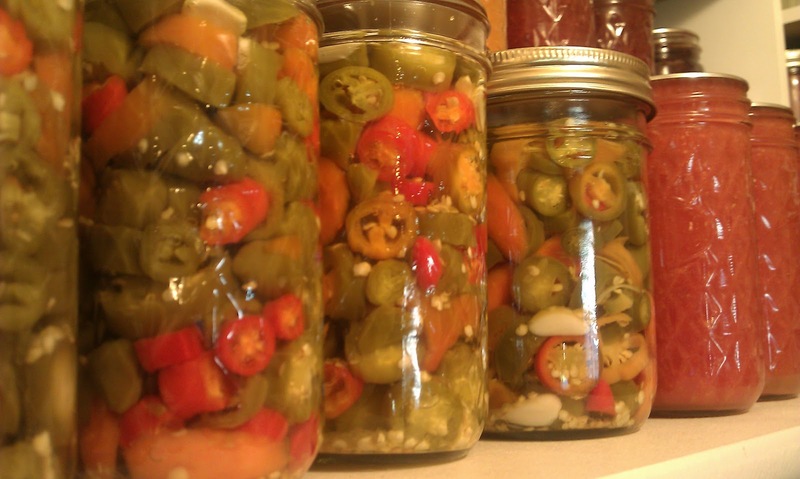 And made dozens of jars of something we’ve named “Hab-Sauce.” I also tried a batch of Habenero Gold this year–it was a new project from my favorite canning book. Habenero Gold is a glorified adaption of jalapeno jelly, which you can eat with tortilla strips and cream cheese or brie. Last year I just substituted jalapenos with habeneros and it was such a hit that this year I decided to try the recipe that showed dainty bits of golden apricot and red bell pepper suspended in the spicy jelly. Girls, help me out here. Who else has a neurotic drive for sharing, community and an intimate society? Is it only women? >I hear you! I struggle with this all the time. I bring in treats to a church gathering, and if there are any left….then maybe….they don't like me. I seem to find joy and acceptance in feeding and sharing things I make with others. The more they like it the better. I always find myself going above and beyond to make things I know people like. Maybe it is the "caregiver" part of woman that God instilled in us. Don't get me wrong, I am a selfish wretch, but I really find joy in sharing things with others….even if they don't want it. >Oh, this has been a struggle for over 11 years at our house. My hubby just likes his own cooking. Occasionally I hit upon something he likes, but just occasionally. I seriously think this was part of what played into my being ready to have children. I so badly wanted someone to like my cooking! 🙂 Sometimes I make food for my neighbor because she always appreciates it. Guess this IS something common to women.